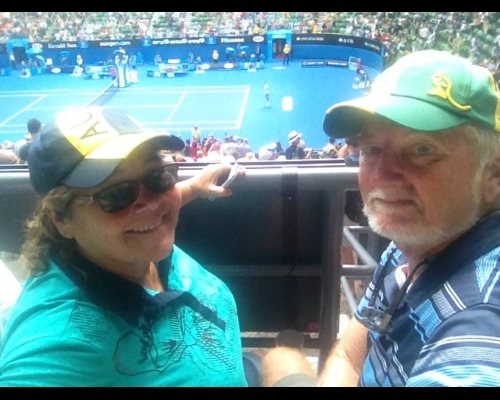 We flew to Melbourne for a week of tennis and cricket. The Virgin flight across was quick, taking only a little over three hours courtesy of a good tail wind and we used the excellent Skybus service to into Melbourne itself. This system is so good that Perth needs to consider something similar rather than wasting a fortune on a rail system that we can’t afford. For $30 each, we got comfortable transport, with never any more than 10 minutes wait, to Southern Cross Station followed by a personalised shuttle service to our hotel. The same ticket gets us a return pickup from the hotel and transfer back right to the door of the departure area. Amazingly, I’ve heard people say it is expensive, yet in Perth, we pay over $60 for a one way taxi ride to the airport. We stayed at the Nova Stargate on Franklin St, really well located. Our room overlooked the Victoria Street Markets so there were always lots of cheap eats around. The room was a small serviced apartment and had all the basics, without being overly flash or expensive. Another bonus is that the nearby tram stops in Elizabeth St are within the new free tram zone so we spent next to nothing on transport for the week. 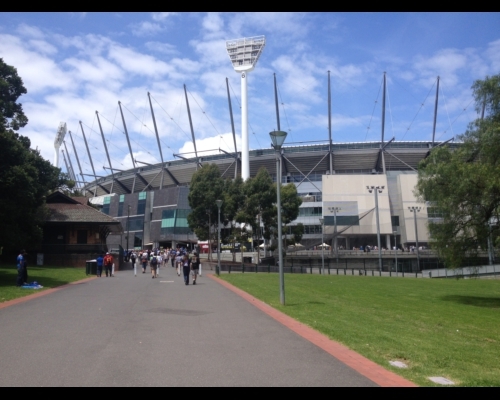 Most days, we took the tram down to Flinders St and then walked along the Yarra Walk to either the MCG or the tennis. The streets are always full of people off to sporting events at this time of year so we blended in with our green and gold shirts and often got questions from shop keepers or tram drivers on the way home about how things had gone with the Aussies. We took the chance to catch up with Azba and Michael, staying the night at their place near Glen Iris so we could consume more red wine than was good for us. They both had a big weekend of a bucks’ night and hens’ party so we helped prime their livers for the onslaught. We caught a lift home with Azba from her work, located in a quirky little part of Richmond where light industrial is giving way to residential and professional. The area was a fascinating mix of derelict factories, old tumbling-down cottages and modern glass boxes. The streets were quiet, like something out of a post apocalypse movie. Azba was astounded when we said we had popped in to the local pub although she admitted that she had never been in but was speaking from its reputation. 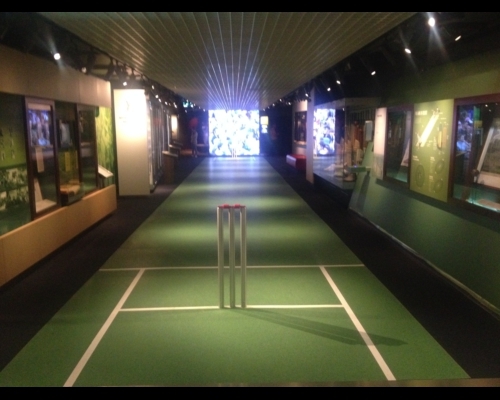 Housed in the MCG, the National Sports’ Museum is a wonderful place to spend a half a day. There are comprehensive exhibits featuring the Olympics, AFL and cricket, with lesser displays covering cycling, tennis, horseracing and a host of other sports. A display following the development of the MCG itself complements the whole thing. Amazing holographic presentations from both Shane Warne and James Hird are particularly interesting. It was hard to believe that we weren’t in a small room with the champions themselves as they gave their ten minute talks. I’d love to see this aspect of the museum expanded to include others, such as Hewitt or Freeman. Down in the AFL display, I tried my hand at kicking a ball at three targets set into a wall. I was doing quite well, scoring a few hits until Christine pointed out that it was actually a handball activity. Things went downhill after that. I need to stick to kicking. We spent about two and a half hours soaking up the “Aussie, Aussie, Aussie” atmosphere before heading back to the hotel. We left a lot undone so a return visit is on the cards sometime. Well worth the effort! 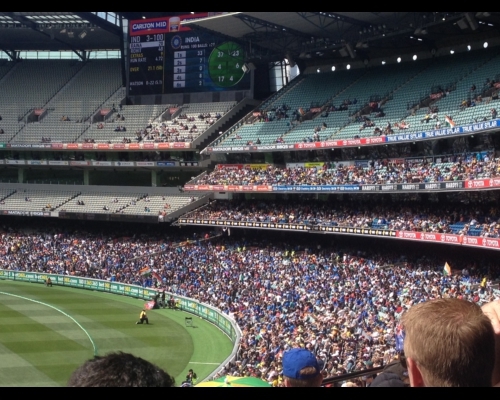 We had tickets to the Australia – India One Day match, originally purchased for the Friday, the day after we flew in. The death of Phillip Hughs saw things rescheduled and our game changed to the Sunday, no big deal, but it did mean that we would be out late on the night prior to the tennis commencing. The match itself was a ripper! Attendance was down for the MCG, with only 35,000. Of these I think there were 20,000 Indian supporters. We seemed to be surrounded by them and the old Bay 13 was a sea of blue and ornage shirts. There was much chanting and whistling. Christine actually resorted to shoving tissues in her right ear to protect against the shrill screaming of the mob next to us. India was out cheaply and Australia seemed to be cruising to an easy victory, until the usual middle order collapse brought on a nail biting finish. We just got there in the end and there was much wailing and sobbing from the sub-continent. 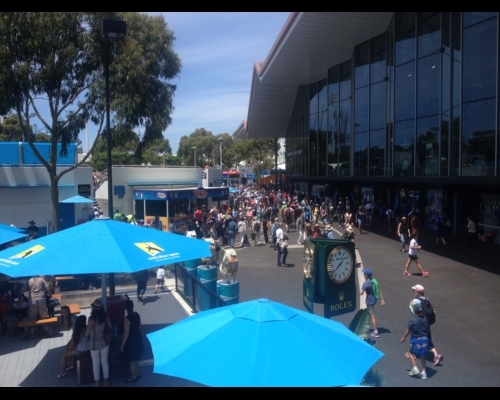 It is hard to imagine a sporting event better organised than the Australian Open Tennis Championship. We went to the first three days and the crowds averaged 40,000 a day, a figure that would put enormous pressure on most systems, especially given that the tournament runs for two weeks. The catering kept up, the transport is fast and efficient and the atmosphere has to be experienced to be believed. A lot of people just buy a general entry ticket and sit around eating, drinking and watching the giant screens, content to be surrounded by lots of sporty types. Others study the draws and court allocations to chase down the great matches on the outside courts that crop up during the first week of the tournament. This year, HiSense Arena was opened up to the general public, providing 9500 undercover seats with top ranked matches available. Show Courts 2 & 3 also provide top matches in comfortable conditions if you work things right and get some shade. 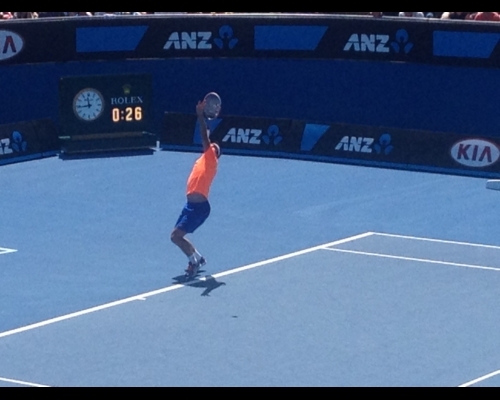 We managed things really well and enjoyed three wonderful days of top-flight tennis. 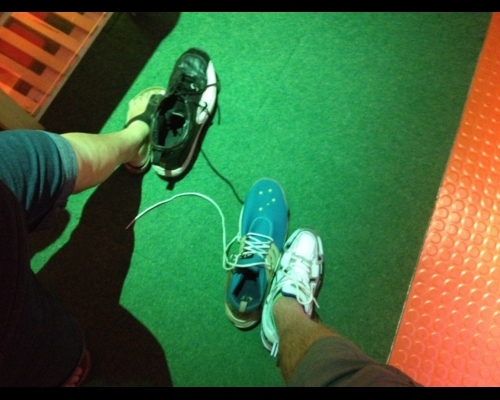 On our final day, we left Show Court 2, having made the decision to have a beer at a bar then head for home. 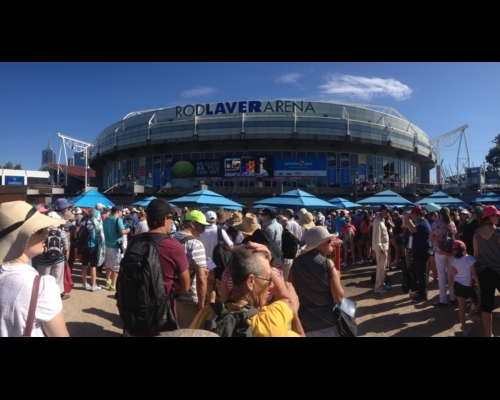 As we headed for the beer line, a woman approached us and asked if we would like two tickets to Rod Laver Arena to watch Roger Federer. The beer was put on hold and we headed in to the inner sanctum. Unfortunately, the seats were a great view but in the sun and things got really hot after a while. We stuck it for a set and a half then gave in, the beer being more appealing. We gave the tickets to two young guys who looked like they would handle the heat better than us. They were thrilled. It was terrific to be part of the best Australian start to an Open in over a decade, giving us no shortage of Aussie matches to go and see. The weather was so much better than the 40 degrees plus of 2014. We will be back sometime. We tried to ease up on the eats a bit this year but it is hard in Melbourne because there is so much on offer at reasonable prices. Street food abounds, especially around Victoria Street Markets. We gave a lot of patronage to a Vietnamese place in Elizabeth St called The Noodle Kitchen. Surprisingly, they have two outlets in Perth, one in Kardinya and one in Thornlie. The food is quite outstanding for the price. It was easy to pick because it was full of local Asian ethnics all day when the surrounding places were empty. The Krispy Kreme mania is still in full swing and we again saw people lining up at the airport outlet to bring boxes of the things home. It makes no sense when every block in Melbourne has at least one amazing sweet food outlet with great looking do-nuts at half the cost of Krispy Kremes. It would be interesting to see a pie graph break-up of production costs vs profit and marketing. Christine managed a very high standard of packed picnic lunches for the tennis and we were often the envy of those around us, although we did eye off their chips with salivating mouths. We resisted and saved our lapses for the beer sampling on the way home.